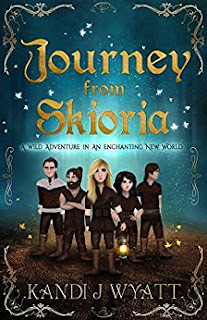 Thank you to Aurora Publicity for an advance reader copy of Journey From Skioria in exchange for this review! Need a nice and easy fantasy escape for your kids? Journey From Skioria by Kandi J. Wyatt might be the answer. The story opens on Tania, a young girl who is mysteriously lost at sea during a storm and wakes up to find herself in another world. The adults are the size of children and everyone lives in trees and berry bushes. Tania feels scared and uncertain, but the people of Skioria quickly determine to help her back to her parents. But along the way, Tania realizes that she’s gained somewhat of a second family in this strange new place. Can she remain a part of both worlds, or must she give up one to keep the other? And that’s not to mention the many obstacles that must be overcome to reach her parents again. I’d recommend this book for young grade school readers. For adults, it can feel disjointed and a bit slow, but friendship, magic, and adventure are at the center from start to finish and will entertain many a young reader. I enjoyed seeing Tania slowly realize that she has two families in two separate worlds and wrestle to figure out how to keep them both. I do think that the author could have done more to develop that struggle and grow her as a character as well as the other characters. I thought most of them were a bit under-developed by the end and most of the conflicts were resolved a little too quickly. But the question of how the group would be able to keep each other as friends was an overall good one that kept the story going. Tania and her friends have a generally good and straightforward adventure that many children will enjoy! Journey From Skioria was released earlier this month and is now available on Amazon or wherever books are sold. Thank you again to Aurora Publicity for an advance reader copy of this work!